Six members of the Dakinban family, have all being killed by unknown gunmen in an early morning attack in Tibiu village of Kumbum ward in Mangu local government area of Plateau State, north central Nigeria. Confirming the massacre, the Public Relations Officer of the Plateau state police command, Deputy Superintendent of Police, Emmanuel Abuh stated the police are intensifying efforts to bring the culprits to book while security has been beefed up in the community to avoid any reprisal or breakdown of law and order. The Speaker of the Plateau State House of Assembly, Honourable John Clark Dabwan, who paid a condolence visit to the village, described the incident as barbaric and ungodly and a setback to the peace process in the state. One of the villagers while narrating the sordid incident to the Speaker explained that the killings were carried occurred at about 3:30AM, early Friday morning. 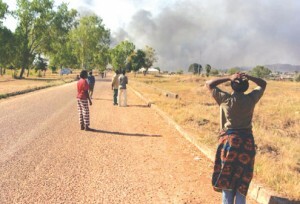 The villager alleged that suspected Fulani herdsmen invaded the village, shooting sporadically into the air, which led to pandemonium and in the process, killing six members of the family while four escaped with injuries. God! What is this country turning into? It's so sad that these horrors are no longer treated as news. Let's keep praying these violence don't turn into full blown civil war. Oh my gosh! There's fire on the mountain and nobody seems to be on the run, there's fire on the mountain top and no one is a running! Maybe it's when half the country is killed before we'll know nobody is safe in this country and something will truly be done about it. Pastor Arrested Over Death Of 6-year Old Girl. See the huge fish a man caught in a Texas Lake!